Ishan Bhardwaj, Narendra D. Londhe, Sunil K. Kopparapu, “User attitude towards novel biometric system and usability analysis,” International Journal of Biometrics, 2018. Ishan Bhardwaj, Narendra D. Londhe, Sunil K. Kopparapu, “Performance Evaluation of Fingerprint Dynamics in Machine Learning and Score Level Fusion Framework” IETE Technical Review, https://doi.org/10.1080/02564602.2018. 1444515. Atul K Dwivedi, Subhojit Ghosh, Narendra D. Londhe, “Review and Analysis of Evolutionary Optimization-Based Techniques for FIR Filter Design,” Circuits, Systems & Signal Processing https://doi.org/10.1007/s00034-018-0772-1. Sumit K Banchhor, Narendra D. Londhe, Tadashi Araki, Luca Saba, Petia Radeva, John R Laird, Jasjit S Suri, “Wall-based measurement features provides an improved IVUS coronary artery risk assessment when fused with plaque texture-based features during machine learning paradigm,” Computers in Biology and Medicine, vol.91, pp.198-212, 2017. Luca Saba, Sumit K Banchhor, Narendra D. Londhe, Tadashi Araki, John R Laird, Ajay Gupta, Andrew Nicolaides, Jasjit S Suri, “Web-based accurate measurements of carotid lumen diameter and stenosis severity: An ultrasound-based clinical tool for stroke risk assessment during multicenter clinical trials,” Computers in Biology and Medicine, vol.91, pp.306-317, 2017. Vimal K. Shrivastava, Narendra D. Londhe, Rajendra S. Sonawane, Jasjit S. Suri, “A Novel and Robust Bayesian Approach for Segmentation of Psoriasis Lesions and its Risk Stratification,” Computer Methods and Programs in Biomedicine, vol.150, pp.9-22, 2017. Rahul K. Chaurasia, Narendra D. Londhe, Subhojit Ghosh, “Multi-objective Binary DE algorithm for Optimizing the Performance of Devanagari Script-Based P300 Speller,” Biocybernetics and Biomedical Engineering, vol.37(3), pp. 422-431, 2017. Banchhor S.K., Londhe N.D., Araki T., Saba L., Radeva P., Laird J.R., Suri J.S., “Well-Balanced System for Coronary Calcium Detection and Volume Measurement in a Low Resolution Intravascular Ultrasound Videos,” Computers in Biology and Medicine, vol.84, pp.168-181,2017. Ishan Bhardwaj, Narendra D. Londhe, Sunil K. Kopparapu, “A spoof resistant multibiometric system based on the physiological and behavioral characteristics of fingerprint,” Pattern Recognition, vol.62, pp.214-224, 2017. Mitul K. Ahirwal, Anil Kumar, G. K. Singh, Narendra D. Londhe, “Performance Prediction of Adaptive filters for EEG signal,” IET Science, Measurement & Technology, vol.11(5), pp. 525-531, 2017 . Ishan Bhardwaj, Narendra D. Londhe, Sunil K. Kopparapu, “Study of Imposter Attacks on Novel Fingerprint Dynamics Based Verification System,” IEEE Access, vol. 5, pp. 595-606, 2016. Tadashi Araki, Pankaj K. Jain, Harman S. Suri, Narendra D. Londhe, Nobutaka Ikeda, Ayman El-Baz, Vimal K. Shrivastava, Luca Saba, Andrew Nicolaides, Shoaib Shafique, John R. Laird, Ajay Gupta, Jasjit S. Suri, “Stroke Risk Stratification and its Validation using Ultrasonic Echolucent Carotid Wall Plaque Morphology: A Machine Learning Paradigm,” Computers in Biology and Medicine, vol.80, pp. 77-96, 2017. Atul K Dwivedi, Subhojit Ghosh, Narendra D. Londhe, “Low power FIR filter design using Hybrid Artificial Bee Colony Algorithm with experimental validation over FPGA,” Circuits, Systems & Signal Processing (CSSP), vol. 36(1), pp. 156-180, 2017. Narendra D. Londhe, Jasjit S. Suri, “Superharmonic Imaging for Medical Ultrasound: A Review,” Journal of Medical Systems, vol.40 (12), 279, 2016. Vimal K. Shrivastava, Narendra D. Londhe, Rajendra S. Sonawane, Jasjit S. Suri, “Reliability Analysis of Psoriasis Decision Support System in Principal Component Analysis Framework,” Data & Knowledge Engineering, vol.106, pp. 1-17, 2016. Rahul K. Chaurasia, Narendra D. Londhe, Subhojit Ghosh, “Binary DE based Channel selection and Weighted-Ensemble of SVM Classification for Novel Brain-Computer Interface using Devanagari Script Based P300 Speller Paradigm,” International Journal of Human-Computer Interaction, vol.32(11), pp. 861-877, 2016. Sumit K Banchhor, Tadashi Araki, Narendra Londhe, Nobutaka Ikeda, Petia Radeva, Ayman El-Baz, Luca Saba, Andrew Nicolaides, Shoaib Shafique, John R. Laird, Jasjit Suri, “Five Multiresolution-based Calcium Volume Measurement Techniques from Coronary IVUS Videos: A Comparative Approach,” Computer Methods and Programs in Biomedicine, vol.134, pp.237-258, 2016. Atul K Dwivedi, Subhojit Ghosh, Narendra D. Londhe, “Low Power FIR Filter Design using Modified Multi-Objective Artificial Bee Colony Algorithm with Experimental Validation,” Engineering Applications of Artificial Intelligence, vol. 55, pp. 58-69, 2016. Atul K Dwivedi, Subhojit Ghosh, Narendra D. Londhe, “Low power 2D FIR Filter Design using Modified Artificial Bee Colony Algorithm with experimental validation using FPGA,” IET Science, Measurement & Technology, vol.10(6), pp.671-678, 2016. Mitul K. Ahirwal, Anil Kumar, G. K. Singh, Narendra D. Londhe, “Scaled Correlation Analysis of EEG: A New Measure of Signal Influence,” IET Science, Measurement & Technology vol.10(6), pp.585-596, 2016. Ishan Bhardwaj, Narendra D. Londhe, Sunil K. Kopparapu, “A Novel Behavioral Biometric Technique for Robust User Authentication,” IETE Technical Review (Published Online - DOI: 10.1080/02564602.2016.1203271). Luca Saba; Sumit K Banchhor; Harman S Suri; Narendra D Londhe; Tadashi Araki; Nobutaka Ikeda; Klaudija Viskovic; Shoaib Shafique; John R Laird; Ajay Gupta; Andrew Nicolaides; Jasjit S Suri, “Accurate Cloud-Based Smart IMT Measurement, its Validation and Stroke Risk Stratification in Carotid Ultrasound: A Web-based Point-of-Care Tool for Multicenter Clinical Trial,” Computers in Biology and Medicine, vol.75, pp.217-234, 2016. Vimal K. Shrivastava, Narendra D. Londhe, Rajendra S. Sonawane, Jasjit S. Suri, “A Novel Approach to Multiclass Psoriasis Disease Risk Stratification: Machine Learning Paradigm,” Biomedical Signal Processing and Control, vol. 28, pp. 27-40, 2016. Atul K Dwivedi, Subhojit Ghosh, Narendra D. Londhe, “A Modified Artificial Bee Colony Optimization based FIR filter Design with Experimental Validation using FPGA,” IET Signal Processing, vol.10(8), pp. 955-964, 2016. Araki T, Ikeda N, Shukla D, Jain P, Londhe ND, Shrivastava VK, Banchhor SK, Saba L, Nicolaides A, Shafique S, Laird JR, Suri JS, “PCA-based polling strategy in machine learning framework for coronary artery disease risk assessment in intravascular ultrasound: A link between carotid and coronary grayscale plaque morphology,” Computer Methods and Programs in Biomedicine, vol.128, pp.137 – 158, 2016. Vimal K. Shrivastava, Narendra D. Londhe, Rajendra S. Sonawane, Jasjit S. Suri, “Computer-Aided Diagnosis of Psoriasis Skin Images with HOS, Texture and Color Features: A First Comparative Study of Its Kind,” Computer Methods and Programs in Biomedicine, vol. 126, pp. 98-109, 2016. Araki T, Banchhor SK, Londhe ND, Ikeda N, Redeva P, Shukla D, Saba L, Balestrieri A, Nicolaides A, Shafique S, Laird JR, Suri JS, “Reliable and Accurate Calcium Volume Measurement in Coronary Artery Using Intravascular Ultrasound Videos,” Journal of Medical Systems, vol. 40(3), pp.51-71, 2016. Tadashi Araki, Nobutaka Ikeda, Devarshi shukla, Narendra Londhe, Vimal Shrivastava, Sumit Banchhor, Luca Saba, Andrew Nicolaides, Shoaib Shafique, John Laird and Jasjit S. Suri, ”A New Method for IVUS-based Coronary Artery Disease Risk Stratification: A Link between Coronary & Carotid Ultrasound Plaque Burdens,” Computer Methods and Programs in Biomedicine, Vol. 124, pp. 161-179, 2016. Rahul K. Chaurasia, Narendra D. Londhe, Subhojit Ghosh, “A Novel Weighted Edit Distance-Based Spelling Correction Approach for Improving the Reliability of Devanagari Script-Based P300 Speller System,” IEEE Access, vol.4, pp. 8184-8198, 2016. Vimal K. Shrivastava, Narendra D. Londhe, Rajendra S. Sonawane, Jasjit S. Suri, “Exploring the color feature power for psoriasis risk stratification and classification: A data mining paradigm,” Computers in Biology and Medicine, vol.65, pp. 54-68, 2015. Vimal K. Shrivastava, Narendra D. Londhe, R.S. Sonawane, Jasjit S. Suri, “Reliable and accurate psoriasis disease classification in dermatology images using comprehensive feature space in machine learning paradigm,” Expert Systems with Applications, Volume 42, Issues 15–16, Pages 6184-6195, September 2015. Vimal Kumar Srivastava, Narendra D. Londhe, “Measurement of PASI Area Score of Indian Psoriasis Patients,” Journal of Medical Imaging and Health InformaticsVol. 5(4), pp. 653-674, August 2015. Vimal K Shrivastava, Narendra D Londhe, R. S. Sonawane, Jasjit S. Suri, "First Review on Psoriasis Severity Risk Stratification: An Engineering Perspective," Computers in Biology and Medicine, vol. 63, pp. 52-63, August 2015. Vinita Thawrani, Narendra D. Londhe, Randeep Singh, “Crowdsourcing Medical Data,” IETE Technical Review31:3, 249-253, 2014. Narendra D. Londhe, R. S. Anand, “Numerical Parametric Study of Superharmonic Field Properties in Nonlinear Ultrasound Wave Propagation in Human Soft Tissues”, Acta Acustica united with Acustica, Vol.98, pp. 1-9, 2012. Saba, L., Banchhor, S.K., Araki, T., Suri, H.S., Londhe, N.D., Laird, J.R., Viskovic, K., Suri, J.S., “Intra- and inter-operator reproducibility analysis of automated cloud-based carotid intima media thickness ultrasound measurement,” J Clin Diagn Res. vol. 12(2), pp. KC01-KC11, 2018. Satya Prakash Sahu, Priyanka Agrawal, Narendra D Londhe, “A New Hybrid Approach Using Fuzzy Clustering and Morphological Operations for Lung Segmentation in Thoracic CT Images,” Biomedical and Pharmacology Journal, vol. 10(4), pp. 1949-1961-2017. Rahul Kumar Chaurasiya, Narendara D Londhe and Subhojit Ghosh, “Comparison of Machine Learning Methods for Devanagari Script-based P300 Speller System,” International Journal of Control Theory and Applications 9(42):477-485, 2017. Satya Prakash Sahu · Narendra D. Londhe · Shrish Verma, “An Automated System for the Detection of Lung Cancer in CT data at Early Stages: Review,” International Journal of Control Theory and Applications 10(18):133-144 · April 2017. Banchhor S.K., Londhe N.D., Araki T., Ikeda N., Saba L., Radeva P., Laird J.R., Suri J.S., “Relationship between Automated Coronary Calcium Volumes and a set of Manual Coronary Lumen Volume, Vessel Volume and Atheroma Volume in Japanese Diabetic Cohort: An Intravascular Ultrasound-based Study” J Clin Diagn Res. Vol. 11(6), pp. TC09-TC14, 2017. RK Chaurasiya, ND Londhe, S Ghosh, “Statistical wavelet features, PCA, and SVM based approach for EEG signals classification,” International Journal of Electrical, Computer, Electronics and Communication Engineering, vol.9(2), pp.182-186, 2015. Narendra D Londhe, Sunil Chaware, “Region of Interest Based Coding of Abdominal CT Images,” Canadian Journal on Image Processing and Computer Vision, vol.4(1), pp. 9-15, 2013. Devendra Joshi, Narendra D Londhe “Fully Automatic Detection Of Liver Lesions In Real Abdominal CT Images,” International Journal of Engineering Research and Technology, vol.2(4), pp. 49-55, 2013. Devendra Joshi, Narendra D Londhe, “Automatic liver tumour detection in abdominal CT images,” International Journal of Computer Technology and Electronics Engineering, vol.3, pp.25-30, 2013. Narendra D. Londhe, R. S. Anand, “Coded Tissue Superharmonic Imaging: An analytical study”, Journal of Medical Ultrasound, Vol. 20, No. 2, pp. 101-108, June 2012. Shweta Arora, Narendra D Londhe, Anuja Kumar Acharya, “Human identification based on iris recognition for distant images,” Int. J. Comput. Appl, vol.45(16), pp.32-39, 2012. Mitul Kumar Ahirwal, Narendra D Londhe, “Power spectrum analysis of EEG signals for estimating visual attention,” Int. J. Comput. Appl, vol.42(15), pp.22-25, 2012. Ishan Bhardwaj, Narendra D Londhe, “Speaker dependent and independent isolated hindi word recognizer using hidden markov model (HMM),” Int. J. Comput. Appl, vol.52(7), pp.34-40, 2012. Narendra D. Londhe, R. S. Anand, “Numerical Investigation of Nonlinear Propagation of Amplitude Modulated Ultrasound Pulses in Human Soft Tissues and Superharmonic Beam Optimization”,Int. J. of Biomedical Engineering and Technology,Vol. 8, No. 1, pp.82-98, 2012. Mitul Kumar Ahirwal, Narendra D. Londhe, “Classification of 2D Hand Movement with Power Spectrum Estimation,”Int. Journal of Biomedical Engineering and Technology, Vol. 9, No. 3, pp. 277-286, 2012. Narendra D Londhe, Sourabh Gupta, Dewesh Dewangan, “A complete ECG signal delineation method based on wavelet transform,” vol.9(2), pp.147-162,2012. Narendra D. Londhe, R. S. Anand, “Numerical Investigation of Superharmonic Imaging Using Chirp Excitation”, Journal of Medical Ultrasound, Vol.19, No.3, pp. 81-86, 2011. Mohit Gupta, Narendra D Londhe, “Low complexity near lossless image compression technique for telemedicine,” Int. J. Comput. Appl, vol.29(7), pp.43-50, 2011. Narendra D. Londhe, R. S. Anand, “Investigation of linear and nonlinear frequency modulated excitation effects on tissue harmonic imaging”, Chinese Journal of Acoustics, vol. 30(3), pp. 227-240, 2011. Narendra D. Londhe, R. S. Anand, “Simulation study of the superharmonic field generated from a phase array”, Chinese Journal of Acoustics, Vol.30, No.4, pp.371-378, 2011. Mohit Gupta, Narendra D. Londhe, “An Improved Low Complexity Near Lossless Image Compression”, Int. J. Signal and Imaging Systems Engineering, Vol. 4, No. 4, pp. 207-211, 2011. Narendra D. Londhe, R. S. Anand, “Investigation of ultrasonic shock wave propagation and superharmonic field generation in human soft tissues,” Int. J. Mathematical Modeling and Numerical Optimisation, vol.1(4), pp. 316-329, 2010. Narendra D Londhe, RS Anand, “Second harmonic field generation from a phased array transducer and its beam optimization,” Int. J. Recent Trends Eng, vol.2, pp.101-105, 2009. Narendra D Londhe, R. S. Anand, “Linear Ultrasound Wave Propagation in Biological Tissues”, Indian Journal of Biomechanics: Special Issue (NCBM 7-8 March 2009), pp. 104-108, 2009. Narendra D Londhe, R. S. Anand, “Ultrasound Shock Wave Propagation and Generation of Harmonics in Biological Tissues”, J. Pure Appl. Ultrason. 33(4), pp. 77-87, 2011. Narendra D Londhe, “PhD Thesis Summary: Behavioral Study of Ultrasound Wave Propagation in Biological Tissues,”J. Pure Appl. Ultrason. 34(4), pp. 94, 2012. Harish Guggilla, Narendra D Londhe and Dilip Kumar Sethi, “Study of Coded Ultrasound Imaging using FIELD II,” J. Pure Appl. Ultrason. 41(2), pp. 98-104, April 2014. Ghanahshyam B. Kshirsagar, Narendra D. Londhe, “Performance Improvement for Devanagari Script Input Based P300 Speller,” IEEE 5th International Conference on Signal Processing & Integrated Networks (SPIN), Noida, 22-23 February 2018. Ghanahshyam B. Kshirsagar, Narendra D. Londhe, “Deep Convolutional Neural Network Based Speech Recognition for Chhattisgarhi,” IEEE 5th International Conference on Signal Processing & Integrated Networks (SPIN), Noida, 22-23 February 2018. Anita Khanna, Narendra Londhe and Shubhrata Gupta, “Detection of pulmonary vessels in 3D lung CT using improved Graph Cut,” IEEE 5th International Conference on Signal Processing & Integrated Networks (SPIN), Noida, 22-23 February 2018. Hitesh Tekchandani, Shrish Verma, Narendra D. Londhe, “Severity Assessment of Lymph Nodes in CT Images using Deep Learning Paradigm,” IEEE 2nd International Conference on Computing Methodologies and Communication (ICCMC), Erode, 15-16 February 2018. Anita Khanna, Shubhrata Gupta, Narendra Londhe, “Automatic Lung Segmentation and Airways Detection using Adpative Morphological Operations,” International Conference on Machine Intelligence and Signal Processing (MISP), IIT Indore, 22-24 December 2017. Neha Sahu, Narendra D. Londhe, “Optimization based selective harmonic elimination in multi-level inverters,” IEEE National Power Electronics Conference (NPEC), Pune, 18-20 Dec 2017. Ghanahshyam B. Kshirsagar, Narendra D. Londhe, “Deep convolutional neural network based character detection in devanagari script input based P300 speller” IEEE International Conference on Electrical, Electronics, Communication, Computer, and Optimization Techniques (ICEECCOT), Mysuru, 15-16 Dec 2017. Satya Prakash Sahu, Priyanka Agrawal, Narendra D Londhe and Shrish Verma, “Lung Segmentation of CT Images using Fuzzy-c-means for the Detection of Cancer in Early Stages,” International Conference on Data and Information Sciences (ICDIS), Amarkantak, 17-18 November 2017. Neha Sahu, Narendra D. Londhe, “Selective harmonic elimination in five level inverter using sine-cosine algorithm,” IEEE International Conference on Power, Control, Signals and Instrumentation Engineering (ICPCSI), Chennai, 21-22 September 2017. Aparajita Saraf, Rahul Kumar Chaurasiya, Narendra D Londhe and Subhojit Ghosh, “Multi-Objective Binary PSO for Improving the Performance of P300 Speller,” IEEE International Conference on Advanced Computational and Communication Paradigms (ICACCP), Sikkim, September 8-10, 2017. Luca Saba, Sumit K. Banchho, Tadashi Araki, Narendra D. Londhe, Nobutaka Ikeda, Andrew Nicolaides, Shoaib Shafique, Michelle Porsu, John R. Laird and Jasjit S. Suri, “Automated Carotid Artery Plaque Burden and Stenosis Severity Measurements: A Web-based Tool for Multicenter Clinical Trial,” 3rd Neurological Disorders Summit (NDS-2016), July 6-8, 2017, Burlingame, CA, USA. Neha Sahu, Narendra D. Londhe, Ghanahshyam B. Kshirsagar, “FPGA applications in inverter and converter circuits: A review on technology, benefits and challenges,”IEEE International Conference on Innovations in Information, Embedded and Communication Systems (ICIIECS), Coimbatore, 17-18 March 2017. Narendra D. Londhe, Ghanahshyam B. Kshirsagar, “Speaker Independent Isolated Words Recognition System for Chhattisgarhi Dialect,” IEEE International Conference on Innovations in Information, Embedded and Communication Systems (ICIIECS), Coimbatore, 17-18 March 2017. Narendra D. Londhe, Ghanahshyam B. Kshirsagar, “Continuous Speech Recognition System for Chhattisgarhi,” IEEE International Conference on Communication and Signal Processing (ICCSP’17), Chennai, 6-8 April 2017. Saba L., Banchhor S.K., Araki T., Ikeda N. Londhe N.D., Viskovic K., Shafique S., Gupta A., Sharma A., Nicolaides A., Laird J.R., Suri JS., “Automated Ultrasound-Based Carotid Lumen Diameter and Stenosis Measurement: A Web-Based Tool for a Multicenter Clinical Trial,” Proceedings of AIUM Annual Convention 2017, 25-29 March 2017, Florida, USA, 2017. Londhe N.D., Suri JS., “Improved Axial and Lateral Image Resolution in Nonlinear Superharmonic Ultrasound Imaging: A Comparative Study of 2 Coded Excitation Methods,” Proceedings of AIUM Annual Convention 2017, 25-29 March 2017, Florida, USA, 2017. Araki T., Banchhor S.K., Ikeda N., Radeva P., Saba L., Balestrieri A., Londhe N.D., Nicolaides A., Shafique S., Laird J.R., Suri JS., “A Comparative Approach Using Multiresolution and Soft Classification Techniques for Fast Coronary Calcium Volume Measurement Using Intravascular Ultrasound,” Proceedings of AIUM Annual Convention 2017, 25-29 March 2017, Florida, USA, 2017. Araki T., Jain P., Ikeda N., Londhe N.D., Saba L., Nicolaides A., Shafique S., Laird J.R., Suri JS., “Coronary Artery Disease Risk Assessment Using a Combination of Intravascular Ultrasound Coronary Wall Grayscale Morphology and Carotid Bedside Ultrasound,” Proceedings of AIUM Annual Convention 2017, 25-29 March 2017, Florida, USA, 2017. Araki T., Banchhor S.K., Saba L., Ikeda N., Londhe N.D., Laird J.R., Suri JS., “Reproducibility and Interobserver Variability Analysis of Automated Cloud-Based Smart Carotid Lumen Diameter and Stenosis Measurement Software,” Proceedings of AIUM Annual Convention 2017, 25-29 March 2017, Florida, USA, 2017. Neha Sahu, Narendra D. Londhe and Ghanahshyam Kshirsagar, “FPGA Applications in Inverter and Ocnverter Circuits: A Review on Technology, Benefits and Challenges,” IEEE International Conference on Innovation in Information, embedded and Communications Systems (ICIIECS’17), Coimbatore, 17-18 March 2017. Narendra D. Londhe, Ghanahshyam Kshirsagar, “Speaker Independent Isolated Words Recognition System for Chhattisgarhi Dialect,” IEEE International Conference on Innovation in Information, embedded and Communications Systems (ICIIECS’17), Coimbatore, 17-18 March 2017. Rahul Kumar Chaurasiya, Narendara D Londhe and Subhojit Ghosh, “Comparison of Machine Learning Methods for Devanagari Script-based P300 Speller System,” 4th International Conference on Advances in Computer Science, Engineering and Technology (ICACSET 2017), Cochin, 25th Feb 2017. Satya Prakash Sahu, Narendra D Londhe, Shrish Verma, “An Automated System for the Detection of Lung Cancer in CT data at Early Stages: Review,”2nd International Conference on Sustainable Computing Techniques in Engineering, Science and Management, Belgaum, 27-18 Jan 2017. I Bhardwaj, N D Londhe, S K Kopparapu “Fingerprint Dynamics: A Novel Biometrics for Personal Authentication” IEEE International Conference on Signal and Information Processing (IConSIP-2016), Nanded, 6-8 Oct 2016. I Bhardwaj, N D Londhe, S K Kopparapu “Feature Selection for Novel Fingerprint Dynamics Biometric Technique based on PCA,” 2016 IEEE International Conference on Advances in Computing, Communications and Informatics (ICACCI 2016), Jaipur, 21-14 Sept 2016. Tadashi Araki, Pankaj K. Jain, Harman S. Suri, Narendra D. Londhe, Nobutaka Ikeda, Ayman El-Baz, Luca Saba, Andrew Nicolaides, Shoaib Shafique, John R. Laird, Ajay Guptaand Jasjit S. Suri, “A Machine Learning Paradigm for Ultrasonic Echolucent Plaque Characterization for Carotid Near and Far Walls - Stroke Risk Stratification,”2nd Neurological Disorders Summit (NDS-2016), September 7-9, 2016, Baltimore, MD, USA. Luca Saba, Sumit K. Banchhor, Tadashi Araki, Nobutaka Ikeda, Narendra D. Londhe, Klaudija Viskovic, Shoaib Shafique, Ajay Gupta, Andrew Nicolaides, John R. Laird and Jasjit S. Suri, “AtheroCloud™: A Web-based Point-of-care Solution for Accurate IMT Measurement System for Stroke Risk Monitoring,” 2nd Neurological Disorders Summit (NDS-2016), September 7-9, 2016, Baltimore, MD, USA. Suri, Jasjit S., Luca Saba, Sumit K. Banchhor, Tadashi Araki, Nobutaka Ikeda, Narendra D. Londhe, Andrew Nicolaides, and John R. Laird. "Web-based Automated Carotid Artery Plaque Measurements Tool for Multicenter Clinical Trial: A Diabetic Cohort Study." In VASCULAR MEDICINE, vol. 21, no. 3, pp. 294-295. 1 OLIVERS YARD, 55 CITY ROAD, LONDON EC1Y 1SP, ENGLAND: SAGE PUBLICATIONS LTD, 2016. N. D. Londhe, M. K. Ahirwal and P. Lodha, "Machine Learning Paradigms for Speech Recognition of an Indian Dialect Recognition", 5th IEEE International Conference on Communication and Signal Processing (ICCSP’16), APEC, Melmaruvathur, India, pp. 637-643, 6-8 April, 2016. M. K. Ahirwal, A. Kumar, N.D. Londhe and H. Bikrol, "Scalp Connectivity Networks for Analysis of EEG Signal during Emotional Stimulation", 5th IEEE International Conference on Communication and Signal Processing (ICCSP’16), APEC, Melmaruvathur, India, pp. 462-466, 6-8 April, 2016. Tadashi Araki, Nobutaka Ikeda, Devarshi Shukla, Narendra Londhe, Vimal Shrivastava, Sumit Banchhor, Luca Saba, Andrew Nicolaides, Shoaib Shafique, John Laird, Jasjit Suri, “Coronary Artery Disease Risk Stratification Using Feature Strength in a Machine-Learning Paradigm: A Link Between Coronary and Carotid Ultrasound Plaque Burdens,” Proceedings of AIUM Annual Convention 2016, New York, USA, pp. S25, March 17-21,2016. Tadashi Araki, Sumit Banchhor, Narendra Londhe, Nobutaka Ikeda, Petia Radeva, Devarshi Shukla, Luca Saba, Antonella Balestrieri, Andrew Nicolaides, Shoaib Shafique, John Laird, Jasjit Suri, “Coronary Calcium Volume Measurement in a Diabetic Cohort Using Intravascular Ultrasound Videos: A Comparative Study,” Proceedings of AIUM Annual Convention 2016, New York, USA, pp. S5, March 17-21,2016. Atul K Dwivedi, S. Ghosh, N. D. Londhe, “Bit Level FIR Filter Optimization using Hybrid Artificial Bee Colony algorithm,” 2015 Annual IEEE India Conference (INDICON), pp.1-6, 17-20 Dec. 2015. R. K. Chaurasiya, N. D. Londhe, S. Ghosh, “An Efficient P300 Speller System for Brain-Computer Interface,” 2015 International Conference on Signal Processing, Computing and Control (2015ISPCC), pp. 57-62, 24-26 Sept. 2015. Kapse, Y.; Londhe, N.D.,"Hybrid HMM/ANN based isolated Hindi word recognition," India Conference (INDICON), 2014 Annual IEEE, vol., no., pp.1,5, 11-13 Dec. 2014. Princy Matlani, Narendra D Londhe, “A Cloud Computing Based Telemedicine Service,” IEEE-EMBS Special Topic Conference on Point-Of-Care (POC) Healthcare Technologies, 16-18 Jan 2013 at Bangalore. Ishan Bharadwaj, Narendra D Londhe, “Hidden Markov Model Based Isolated Hindi Word Recognition,” IEEE International Conference on Power, Control and Embedded Systems (ICPCES-2012) Dec. 16-19, 2012. Mitul Kumar Ahirwal, Narendra D. Londhe, “Offline Study of Brain Computer Interfacing for Hand Movement Using OpenViBE,” IEEE International Conference on Process Automation, Control and Computing (IEEE-PACC2011) 20-22 July 2011 at Coimbatore. Narendra D. Londhe, R. S. Anand, “Simulation of Ultrasound Wave Propagation and Beam Optimization,” International Conference on Biomedical Instrumentation and Healthcare Engg. (ICOBIAHC '09), 6th to 8th of August 2009 at Chennai. Narendra D Londhe, R. S. Anand, “Superharmonic Imaging: A Review”, XIX National Symposium of Ultrasonics, 30 – 31, Oct. 2012. Narendra D.Londhe, Dr. R. S. Anand, “Linear Ultrasound Wave Propagation in Biological Tissues”, National Conference on Biomechanics (NCBM-09), March 7-8, 2009 at Department of Mathematics, IIT Roorkee. Received Best Paper Award for a published research article in Journal of Medical Ultrasound (Elsevier). The award included a Visiting Scholarship to attend the 30th Annual Convention of Taiwan Society of Medical Ultrasound on 18-19 Oct 2014 at Taiwan International Convention Centre, Taipei, Taiwan. Received T K Saxena Memorial Award of Ultrasonics Society of India for best PhD Thesis in the field of Ultrasonics and applied research on 30th Oct. 2012 in XIX National Symposia of Ultrasonics 2012 (XIX NSU-2012) organized at National Physical Laboratory, New Delhi. Received “Best Paper Presenter” award for the paper presentation in IEEE Int. Conference on Electrical, Electronics, Communication, Computer Technologies and Optimization Techniques (ICEECCOT) 2018 conducted on 15-16 December 2018 in Mysuru, INDIA. Organized a short term training programme on “Medical Signal & Image Processing - II” from 22-27 May 2017 in Department of Electrical Engg., NIT Raipur. Organized a short term training programme on “Biosensors & Signal Processing” on 22nd& 23rd Dec 2016 in Department of Electrical Engg., NIT Raipur. Organized a short term training programme on “Medical Signal & Image Processing” from 22-27 August 2016 in Department of Electrical Engg., NIT Raipur. 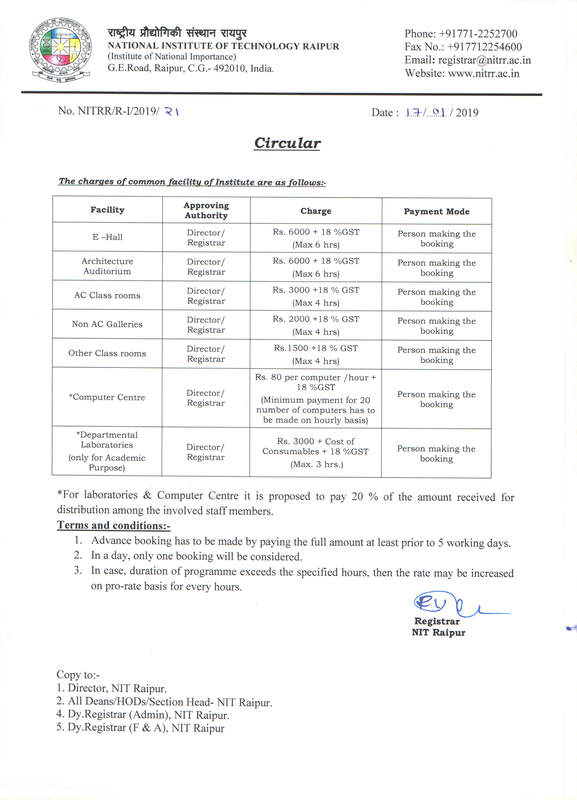 Organized a short term training programme on “Soft Computing Techniques and Its Applications” from 22-26th June 2015 in Department of Electrical Engg., NIT Raipur. Organized a short term course on “MATLAB based Design and Implementation of Advanced Control, Signal & Image Processing Algorithms” from 16-21st August 2013 in Department of Electrical Engg., NIT Raipur. Organized a four days workshop on “MATLAB and LabVIEW” from 28-30th March 2014 at Dept of Electrical Engg, NIT Raipur. 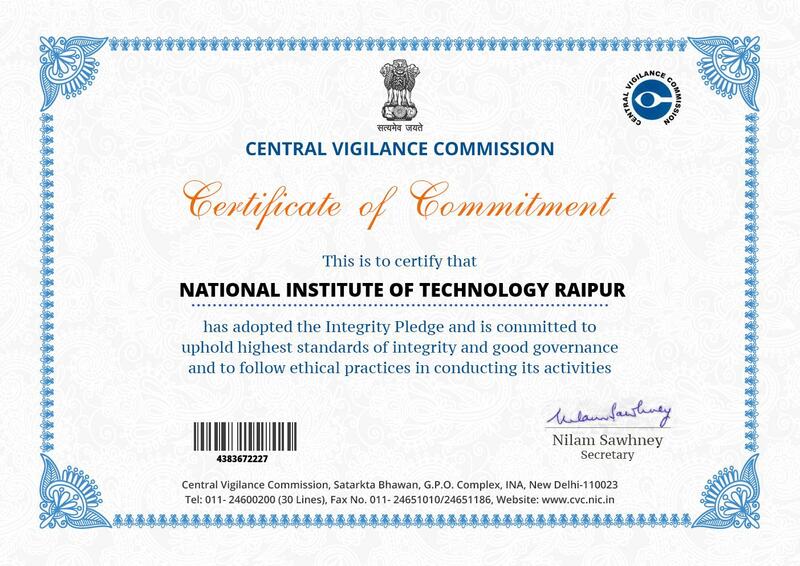 Organized two days workshop on “National Ethical Hacking,” on 7th and 8th Oct 2014 at Dept of Electrical Engg, NIT Raipur. Organized IEEE Student Branch NIT Raipur certified training on "Basic Programmable Logic Circuits (PLC)" of SIEMENS on 15th and 26th Dec 2014 in Department of Electrical Engg of National Institute of Technology Raipur. Application of MATLAB in Engineering and Interdisciplinary Areas organized by Electrical Engineering Department, College of Engineering and Management, Kolghat 8-9 Jan 2014. Advanced Material Physics organized by Department of Physics at National Institute of Technology Raipur from 19-23 May 2014. 30th Annual Convention of Taiwan Society of Medical Ultrasound at Taiwan International Convention Centre, Taipei, Taiwan from 18-19 Oct 2014.